It’s Super Bowl week and all of the talk is about the big game. 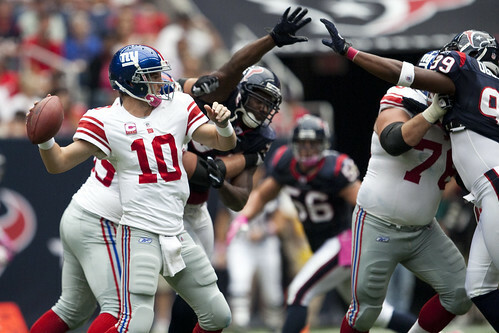 Much of the conversation is in comparing the play of quarterbacks Eli Manning and Tom Brady. When comparing quarterbacks, arm strength and ability to throw the football are always at the top of discussion. But what goes into a quarterback’s arm strength and ability to throw? Throwing, kicking, and hitting activities all depend on what is called “the kinetic sequence”. This is a series of body movements that transfer energy from the ground up the chain of body segments to deliver a whip-like force to the end segment. In throwing, this series of movements create the “whip” upon the hand and finally the football. The more efficient the whip, the more power is generated to the ball. In a recent article, Sam Borden summarizes how in spite of his physical size, Eli Manning generates tremendous arm strength from the ground up. To be one of the best takes more than brute strength; it takes technique, physical ability, and a great mindset. And both of our Superbowl Quarterbacks have it. Fundamentals – Quarterbacks must develop good throwing technique. What is the good technique or throwing sequence? Watch this Sports Science episode to see Drew Brees’ technique and incredible accuracy. Flexibility – Quarterbacks must develop the muscular flexibility and joint range of motion to create load and store energy to release the “whip” in the throw. Core strength/stability – Quarterbacks must have core stability, or the strength within the body to stabilize individual moving parts to help transfer energy to the next moving segment. Quarterbacks like Eli Manning, Tom Brady, and Drew Brees have all of these qualities. This is what makes them great. For NFL quarterbacks, functional training is about training the specific movement patterns and sequences necessary to throw. So while watching the Superbowl, take time to recognize the expertise and skill with which both quarterbacks play, and to think about your own athletic abilities. Are you training for function? Are your workouts specific? For more tips and information, like us on Facebook or follow us on Twitter. If you have any questions about functional training, give us a call.